A total of five games are listed on the day’s fixtures, but the College Football Playoff semi-final battles will grab the focus of attention with No. 1 and defending national champion Alabama bracing for a tough challenge in its quest to retain the title. The undefeated Crimson Tide (13-0) will take on Big 12 powerhouse and No. 4 Oklahoma in the 2018 Orange Bowl at Tide Hard Rock Stadium in Miami, Florida. Game time for what is expected to be a thrilling college football playoff semi-final, is set for 8:00 pm ET and it will be live on ESPN and streaming on WatchESPN. The much-anticipated battle between two of the nation’s top quarterback should provide additional excitement in a game that is expected to produce points. Tua Tagovailoa, who will return from an ankle injury, will lead the offense for Alabama, while Oklahoma will be led by Heisman Trophy winner , who edged Tagovailoa for the award. Meanwhile, Alabama will be without three players, including starting offensive lineman Deonte Brown, after they were suspended for a violation of team rules. Tight end Kedrick James and offensive lineman Elliot Baker failed to make the trip to Miami as well. There is better news, however, for the Sooners (12-1) as Murray’s top receiving option, Marquise Brown has recovered from the ankle injury he picked up in the Big 12 title game and will be available to play. 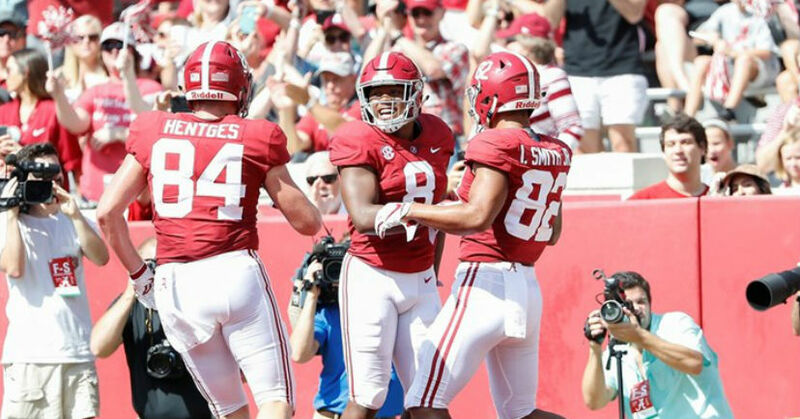 According to ESPN’s Football Power Index, the Crimson Tide have a 73.3 to beat Oklahoma, but experienced coach Nick Seban remains wary, especially going up against the all-purpose Murray. Saban said about facing Murray: “I think the guy is one of the most dynamic players I’ve ever seen in college football. Before this matchup, though, No. 2 Clemson and No. 3 Notre Dame will clash in the day’s first College Football Playoff semi-final when they meet in the 2018 Cotton Bowl. The venue for this one is the AT&T Stadium in Arlington, Texas, with ESPN and WatchESPN providing the coverage, starting at 4:00 pm ET. Both Clemson (13-0) and Notre Dame (12-0) enter this weekend’s battle undefeated, therefore at least one unbeaten side will play in the national championship game. Clemson will be making its fourth consecutive College Football Playoff appearance. Saturday’s game, however, will see the Tigers making their first trip to the Cotton Bowl since 1940 and coach Dabo Swinney is looking forward to making his debut. “I’ve been in college football for a long time, and I’ve never had the opportunity to experience the Cotton Bowl,” Swinney said. The Fighting Irish, who are making their first appearance in the College Football Playoff, are returning to the Cotton Bowl for the first time since 1994. Prior to the playoff games though, the Chick-fil-A Peach Bowl between No. 10 Florida and No. 7 Michigan at Mercedes-Benz Stadium will get the bowl schedule underway at Noon. ESPN and WatchESPN will also provide the live broadcast. Two other bowl games will round out the list for Saturday. At the Bank of America Stadium in Charlotte, North Carolina, South Carolina will start overwhelming favorites to beat Virginia in Belk Bowl, according to ESPN’s Football Power Index, while it’s Nevada vs Arkansas State for the Nova Home Loans Arizona Bowl at Arizona Stadium in Tucson. The North Carolina vs South Carolina battle is live on ABC and WatchESPN, while CBS Sports Network will provide coverage of the Nevada vs Arkansas State encounter.